When I became a U.S. Women’s National Team fan in 2011 and more so in 2012, it was because I fell in love with the personalities of the players on the team. As you may know, they got my attention after their dramatic 2011 Women’s World Cup Semifinal win against Brazil on penalties. I watched the rest of that World Cup and realized how amazing these women were at their craft. It was a year later when I got to know them as more than just athletes though. I watched videos, read articles, books, and interviews, followed twitter accounts, and in turn learned so much about these incredible role models. They had a strong core group of players lead by Abby Wambach and Christie Rampone. They had young rising talent in Alex Morgan and Sydney Leroux. They also had several players in the middle of the pack who brought special elements to the team. Some were around for years, while others made their way into the lineup over the last cycle (the 4 years between World Cups). One of those players was Heather O’Reilly, who I quickly learned was known to the Women’s Soccer world as HAO (pronounced Hey-Oh) (O’Reilly’s initials which stand for Heather Ann O’Reilly). The New Brunswick, New Jersey native made her USWNT debut in 2002 while still in high school. She played alongside 1999 Women’s World Cup heroes Mia Hamm, Kristine Lilly, Julie Foudy, Brandi Chastain, and Brianna Scurry. Then she began her storied college career at women’s soccer powerhouse, the University of North Carolina under legendary head coach, Anson Dorrance. At UNC, she was a part of 3 National Championship winning teams and also made the USWNT roster for the 2004 Olympic Games, where she helped the team to Olympic Gold. After college, she continued with her USWNT career and played professionally once women’s leagues were again formed in the U.S. by joining Sky Blue FC in the WPS and the Boston Breakers and FC Kansas City in the NWSL. HAO currently plays for FC Kansas City. As a member of the USWNT, O’Reilly played in 230 matches, scored 46 goals, assisted on 54 goals, won 3 Olympic Gold Medals (2004, 2008, 2012) and 1 World Cup Championship (2015), out-performed everyone on the beep test multiple times, and displayed a limitless amount of game faces. HAO has been nothing short of incredible. Tonight she will play her final game as a member of the USWNT. She isn’t retiring from the game of soccer by any means, just from international play. Nonetheless she will be missed tremendously on the world’s stage. With the additions of many new faces to the USWNT in the past year, HAO’s playing time dwindled. I’m guessing it may have played a role in her decision. Despite that and the fact that she was named an alternate for the 2016 Olympic Games, I didn’t see this one coming. It hurts a lot more than the rest. She’s only 31, which is on the older player range, but still not as old as some. HAO was also a part of the USWNT for so long. She was a part of that core group I began following when I became a fan and part of a special duo that most fans of the team know and love. As a midfielder, HAO played along the right side of the field. Somewhere along the way, which I believe began around the 2011 Women’s World Cup, she formed an in-game connection with right outside back Ali Krieger and the phrase “right side, strong side” began. I’m not sure who coined the phrase. It might have been an announcer, a fan, or even the pair themselves, but it became known among the USWNT community that #9 and #11 in the game equals right side, strong side. They might have coined the phrase themselves because they use it too. Hopefully HAO and Kriegs take the field tonight and play one last time dominating the right side of the pitch. Either way it will surely be an emotional night for HAO’s family, friends, teammates, coaches, and fans who watched her perform for the red, white, and blue. She’s the true definition of world class and represented U.S. Soccer in the best way possible. Thanks HAO for all you’ve done both on and off the field. Right side, strong side forever! Before the game last night, I knew I would be feeling some kind of emotion when it was over. It would either be pure elation or some sort of numbness. Honestly, a part of me felt like if any team in this tournament could beat the USWNT, it would be Germany. Germany had been playing awesome. The U.S.A. had been average with glimpses of awesome. For the first time during this tournament, I was unsure of the outcome. Needless to say, I shouldn’t have been so worried because last night when the USWNT played the number one team in the world, Germany, at Olympic Stadium in Montreal, Quebec, they won 2-0. The win secured their spot in the FIFA Women’s World Cup Final on Sunday at BC Place in Vancouver, British Columbia. Hell yes. They made it. One more win to go for World Cup glory. The game last night was a roller coaster of sorts, but the USWNT was on top of the hills most often. The match started out in Germany’s favor for about the first few minutes or so. Germany controlled the play and attempted to create scoring opportunities. The unstoppable defense of the USWNT was able to thwart away any chances though. After that short spurt of German momentum, the red, white, and blue took over the possession and got chances in their attacking third. The chances they had were some of their best of the entire tournament too. Julie Johnston almost headed home a Megan Rapinoe corner kick in the 7th minute. Alex Morgan split two defenders and had a chance at the first goal in the 15th minute, but Germany’s goalkeeper Nadine Angerer came up with a huge stop on her shot. For the entire first half, the USWNT disallowed Germany to do what they’ve been so good at doing since their opening match, dictating the game through their skilled play and scoring ability. Again, however, the U.S. was unable to convert their chances and went to the locker rooms tied 0-0. The break seemed to disrupt the flow of the game for the USWNT. After the teams took the field for the second half, Germany controlled early again. This time it seemed they had control for longer than they had in the first half. In fact, it seemed they were on the verge of breaking through the defensive wall, also known as the USWNT back line, but just when they had it cracked, momentum swung the other way. In the 59th minute, German forward Alexandra Popp broke through the back line and U.S. defender Julie Johnston hauled her down inside the 18 yard box, which drew a yellow card and a Germany penalty kick. Celia Sasic attempted the kick for Germany against U.S.A. goalkeeper, Hope Solo. Sasic missed the net. Had she not, Germany would have taken the lead because Solo dove to her left in the opposite direction of Sasic’s shot. Ten minutes later, a Germany defender was called for taking down Alex Morgan inside the penalty area and a PK was awarded to the USWNT. Carli Lloyd, who converted a penalty in the Round of 16, took the kick for the U.S. She scored. 1-0 U.S.A. They then took control for the last 20 minutes of the match. In the 75th minute, Kelley O’Hara, who started the quarterfinal in place of Rapinoe, came on for Tobin Heath. The switch was an important one because 9 minutes later O’Hara put up the insurance goal when she tapped in a Carli Lloyd pass from the endline. It was O’Hara’s first ever international goal (what a time to put up your first goal right?!). With only 6 minutes plus stoppage time left after the goal, the World Cup final was in their grasp. They closed out the game and earned the right to play for the trophy. In an interesting strategic decision for this #1 versus #2 showdown, the USWNT came out in a 4-3-3 formation in favor of the standard 4-4-2 they had played in their other 5 matches. It proved to be a great tactical move. It opened up the midfield for the U.S., which allowed space for the midfielders to create opportunities going forward. The game also saw Rapinoe and Lauren Holiday back in the lineup after missing the quarterfinal for yellow card accumulation. Rapinoe played on the left side of Alex Morgan at the top of the 4-3-3. Holiday played the midfield along with Morgan Brian and Carli Lloyd. The USWNT back line of Ali Krieger, Julie Johnston, Hope Solo, Becky Sauerbrunn, and Meghan Klingenberg continued their shutout streak, which is currently at 513 minutes. Hope Solo received her 5th consecutive shutout, 10th in World Cup play, and 89th overall in her career. The back line has proved time and time again to be the biggest difference maker for the USWNT in the 2015 Women’s World Cup. If the U.S.A. is destined to win Sunday night, the defense will be a guaranteed factor. As I sit here, now, writing this, I can’t help but feel overjoyed for this team. I can’t believe how far they’ve come since Germany in 2011. I can’t believe how far the women’s game has come since then as well. If they win the World Cup, more progress will be made for soccer in America and for women’s soccer in America. We can only hope that the progress will impact women’s soccer in a more permanent way than in the past. This World Cup journey four years in the making is quickly coming to a close. One game remains for the USWNT. It’s the biggest one of all. It’s the Women’s World Cup final. See you Sunday night in Vancouver. It’s time. Let’s get it! In 223 days, the 2015 Women’s World Cup kickoffs in Canada and the United States Women’s National Team (USWNT) will be a part of it. For the past week and a half the team has been competing in the CONCACAF Qualifying Tournament which allows three teams from the CONCACAF region to qualify for the World Cup. With a win against Mexico last night the USWNT became one of the three. 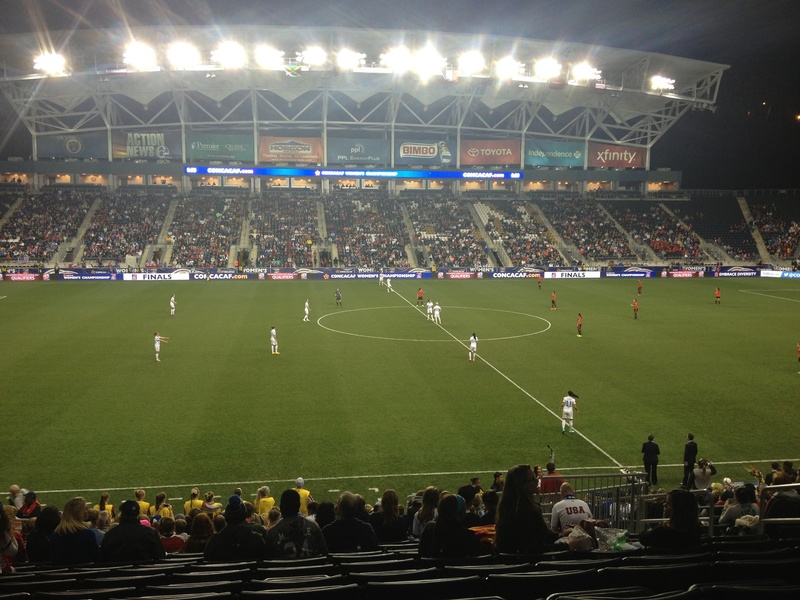 I was lucky enough to be able to attend the match in Philadelphia where the U.S. put up a 3-0 victory to secure their spot. The win also guaranteed them a spot in the CONCACAF Qualifying Tournament championship match on Sunday at 6 p.m. When I was growing up, I never would have guessed that I would become a soccer fan. In fact I remember thinking and saying to myself at one point several years ago while flipping TV channels and landing on a soccer game that I would never attend a pro soccer match or ever be interested in a game. Now, here I am, a day after attending a soccer game. Things change. I guess the only thing to point out is that the game I attended was a women’s soccer match but that game on TV was all men. I’m sure there’s a difference between men’s and women’s soccer but I don’t watch the guys so I wouldn’t know (aside from some of the World Cup this past summer). I love watching the women play though, but especially this group pulled from all areas of the United States. Thanks to the internet, social media, Youtube and other technology I was able to learn a lot about the players on the USWNT. I don’t just mean facts about them either. In this technological age you really get a feel for what kind of a person someone is by what they say on social media, how they act, or what their interests/opinions are. It’s super incredible. At the same time though, it’s only half the story. Someone could be entirely different from how you expect them to be. Even if that is the case, I would still have to argue that we’re better off finding out more about people than we were before all this technology happened, especially with social media. U.S. Soccer has done a great job with their youtube channel to introduce/interview players and show their personalities through special videos that don’t just show highlights from the last match (although they have those too). Because of the youtube videos, instagram, twitter, tumblr, and other internet sources, I really fell in love with this team of individual athletes since I first started to pay attention to them in July 2011. There’s nothing I want more for them than to win the World Cup next year. It’s evident that they want it too. The United States hasn’t won the World Cup since 1999 which made players like Mia Hamm, Brandi Chastain, and Julie Foudy household names. The route to the final in 2011 put this current group of players in the eye of the sports world, but they fell short. Next year a large majority of those same players will be playing in front of the world trying to achieve what all but one have yet to accomplish, winning a World Cup (Christie Rampone was the only current US player on that 1999 squad). Ever since the loss to Japan on penalties in 2011, these women have been training to make it back to the World Cup final and come out victorious. At this point though the 2015 Women’s World Cup may be the last for many players on the squad. This amazing group might not look a lot like they do now in 2019. Abby Wambach has spoke of retirement. Christie Rampone plans to retire after the tournament (she’ll be 40 when it’s over). Hope Solo, Carli Lloyd, and Ali Krieger are already in their 30’s. Becky Sauerbrunn and Heather O’Reilly will be 30 before the World Cup begins June 6th. Megan Rapinoe turns 30 the day the final is scheduled to be played. Lauren Holiday, Kelley O’Hara, Amy Rodriguez, and Tobin Heath will also be in their 30’s by the time the next world cup comes around. All the players mentioned above were with the team in 2011. That’s a large chunk. With age, health and fitness issues can come into play. Not only that but players may even want to start families and pursue other opportunities. So for me, for other fans, and for this team, the time is now. It’s win the World Cup or bust. Of course who knows, maybe in 2019 a lot of those players will be around, but I just have this feeling like that won’t be the case. They know 2015 is the year. They’ve been ranked as #1 in the world for quite awhile and the 2015 Women’s World Cup is the time to prove it. So last night when the final whistle blew, I could feel the good vibes flowing from the field, but it was only for momentary celebration. They made it. They’re going to Canada. They qualified, but there’s no way they’ll be satisfied until the World Cup trophy is in their grasp and gold medals hang from their necks. Right before kickoff of the USAvsMEX Semi-final match last night. Sorry for the iPhone quality.